Save the Date! 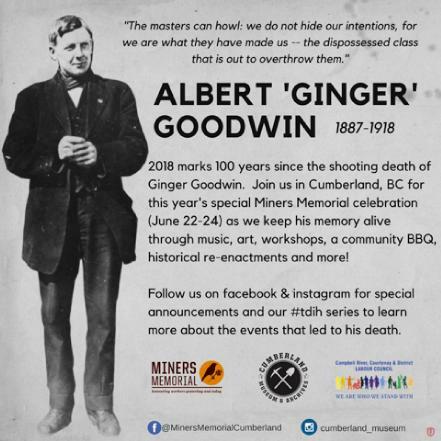 Invitation for you and your organization to participate in this year’s special 100th anniversary event recognizing the shooting death of Ginger Goodwin at the Miner’s Memorial weekend, co-hosted by the Cumberland Museum and Archives with the Campbell River, Courtenay and District Labour Council. Read about the plans for this weekend here. Albert “Ginger” Goodwin was a union man, a socialist and a pacifist. He was a player in the bitter “Big Strike” on Vancouver Island from 1912- 14 that started and ended in Cumberland. Blacklisted after the strike he moved to Trail BC to work in the smelter and began agitating for the 8 hour day. Declared unfit for military service in WW1 having worked in coal mines since he was 15 years old, he was declared “fit” for service when the Government initiated conscription laws. He challenged the designation but was unsuccessful. He left Trail, came back to Cumberland where he and others hid at nearby Comox Lake. On July 27 1918 Special Constable Dan Campbell shot and killed Ginger Goodwin. There were no witnesses. Ginger’s funeral on August 2, 1918, stretched from the town to the graveyard. It caused the first general strike in BC as the Vancouver Trades and Labour Council downed tools that day. 2018 is the 100th anniversary of Ginger’s death. For 33 years Miners Memorial has been a major fundraiser for the Cumberland Museum and Archives, co-hosted with the Campbell River, Courtenay and District Labour Council. This year will be a larger than usual event. We are writing to ask you to consider participating in the event as a sponsor, by laying a wreath on Ginger’s grave, by informing your membership of the event and encouraging participation. All of the above and more is needed to make sure this event is successful. Download and read more information here about how your organization can be involved in this historic event.